The «Book of Changes» — the I Ching — is an ancient book of divinations. Its contributions are said to date back to the 7th or 6th century B.C. The work is most probably based on four different forms of prophecy: firstly, interpretations and predictions stemming from the rural world; secondly, the «match sticks» method (longer or shorter match sticks being held in the hand so that their tips are seen, but not their lengths — the resultant symbols are determined from the long or short matches chosen); thirdly, the meaning of signs recognisable in the plates on the tortoise’s shell or the shoulder blades of mammals; and fourthly, dice or dominoes. The appendix originates from about the 4th century B.C. and introduces the idea of Ying und Yang. Our language and terms of reference impose a certain restriction if we wish to explain the meaning of this purely eastern concept: Yin and Yang represent two complementary forces or principles which define all aspects or manifestations of life. The term «complementarity» also causes us a few problems with the related colours: simultaneously, Yin and Yang both contradict and complement each other; they oppose and assist each other; they are neither separable, nor can they be unified; together, they make up an indivisible whole. Indeed, there is no separate entity for either Yin or Yang, only Yin and Yang together. The earth and darkness are associated with Yin, the feminine and passive — the accommodating. In a complementary way, Yang is characterised by heaven and light, the masculine, active and penetrating. Faithful to this construction of opposites, it is apparent that the dark vowels characterise brightness, and vice versa. The harmony of Yin and Yang — elemental forces active since the beginning of creation — is represented by a circle in which white and black attempt to entwine, although there is no danger that one of these powers will prove dominant since the two shapes have long held their opposite within them: two dots, black and white, reassure that the equilibrium as a whole is not jeopardised. In addition to these two famous pairs — Yin and Yang mean literally «the dark and the light side of a hill» — another 64 symbolic groups of six have found their way from the Book of Changes into Western thought. In each case, they consist of six continuous or subdivided lines, or the association of two groups of three. These sets of three are constructed from the bottom upwards. A continuous line represents the masculine, positive and active principle (Yang) to which we ascribe the number 1. A broken line represents the feminine, negative principle (Yin), to which we assign the number 0. 8 different groups of three (pa kua) can be constructed using these two basic building blocks, which each possess a special name, a basic meaning and a symbolic value. They represent the creative, receptive, stimulating, unfathomable, silent, gentle, adherent and serene. Two groups of three give rise to one hexagram (group of six), and the 64 different combinations represent 64 cosmic archetypes, the elementary images pertaining to situations. They form the groups of three representing the stimulating and the receiving — the hexagram of enchantment. 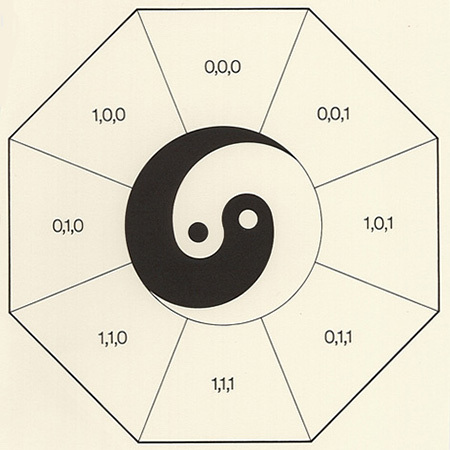 For each hexagram, the I Ching contains a pool of wisdom. It says of enchantment, for example, that it should never be an egotistical feeling, being justifiable only as a general mood in conjunction with other moods. The Chinese tradition’s complementary principles dictate the allocation of the colour (illustration) orange to Yin, and the colour azure to Yang. 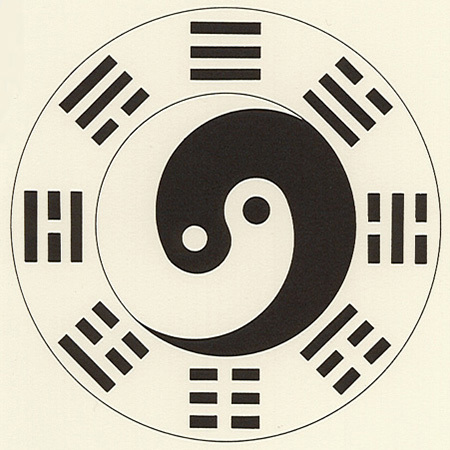 The eight fundamental combinations of the I Ching have been employed here in a personal interpretation, in that six colours and the two extremes of white and black have been assigned to them. Since Yang is associated with light, white will result from the combination 1,1,1. Accordingly, black is obtained by the triplet 0,0,0. The six chromatic colours can be divided into two groups of three parts in each case possessing either one or two subdivided lines (dark elements): the trio of 1,0,0 (yellow); 0,1,0 (azure or blue); 0,0,1 (purple) can be interpreted as primary colours, and 0,1,1 (violet); 1,0,1 (red); 1,1,0 (green) as secondary colours. 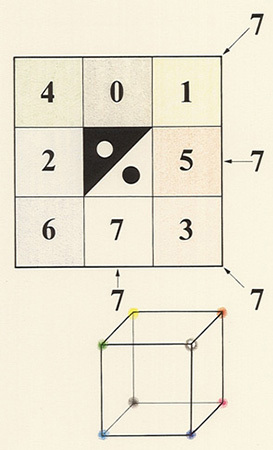 If we number them from 0 to 7, the 8 groups of three also provide a basis for constructing a magic square where all the lines passing through its centre add up to 7 — the number so often encountered with colours. A spacial interpretation can be found in the cube, which is not limited to a geometrical function in this case, but serves rather as a linguistic model for the explanation of the universal system of communication. Black would here be silence, with the primary colours representing a monologue, the secondary colours dialogue, and white the choir. Bibliography: Richard Wilhelm, «I Ging Das Buch der Wandlungen», translated from the Chinese and explained, Diederichs, München 1967; Katya Walter, «Chaosforschung, I Ging und genetischer Code», Diederichs, München 1992.